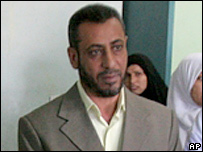 US and Iraqi forces in Baghdad have arrested the deputy health minister during a raid at his offices. The minister, Hakim al-Zamili, is a key member of the political group led by radical Shia cleric Moqtada Sadr. He is accused of aiding Shia militiamen and using ambulances to move weapons, a ministry source told the BBC. The arrest came on the day Gen David Petraeus arrived in Baghdad to assume command of US forces in Iraq and oversee a push against militants. Gen Petraeus will take over this weekend from Gen George Casey, who has been promoted to US Army chief of staff. 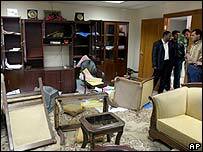 As well as the raid on the health ministry, there were another series of sectarian attacks in Iraq. A car bomb killed at least 20 people and wounded dozens in a market in the predominantly Shia town of Aziziya, south of Baghdad, while 10 people died in a car bombing in a mainly Shia district in the eastern of the capital. Elsewhere, 14 people said to be from one Sunni family were reportedly killed by gunmen in Balad, north of Baghdad. Iraqi officials say US and Iraqi troops broke down doors in the health ministry's offices in central Baghdad in their search for Mr Zamili. Shattered glass littered the floor, computers were overturned and a large white boot print was left on the office door, the Associated Press news agency reported. The minister and some of his guards were arrested. The US military said Mr Zamili was allegedly implicated in the deaths of a number of ministry officials. It said he had also allegedly channelled millions of dollars to Mr Sadr's Mehdi Army militia. Mr Sadr's group accused the US of provocation and urged the government to take immediate action to free the official. "They are trying to drag the Sadrist movement to a confrontation. How else would arresting a deputy health minister without an arrest warrant be read," Abdel Mahdi al-Matiri, an official in Mr Sadr's movement, told Reuters news agency. The raid on the Iraqi health ministry comes more than two months after suspected Sunni insurgents tried to storm the building, triggering a fierce gun battle. US and Iraqi forces have announced a major offensive in the Baghdad area, aimed at ending spiralling violence by Sunni and Shia militants. The BBC's Jane Peel in Baghdad says that in the past some members of Iraq's governing Iraqi coalition have provided militias with protection. Last month the US military said operations had led to 16 senior members of the Mehdi Army being detained and one commander being killed. On Wednesday Iraqi Prime Minister Nouri Maliki urged his military commanders to speed up preparations for the new security measures in Baghdad. He said a delay in implementing the US-backed plan had started to give a negative message.